If you’ve ever wondered what goes on behind the scenes of a non professional drama group then this is the show for you. 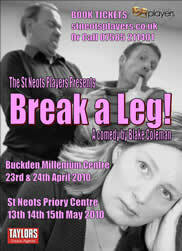 Break a Leg follows a hapless amateur drama group as they go about staging a show. From drunken directors through to drama queens, from script selection through to stage production, this quirky, hilarious yet touching script from new playwright, Blake Coleman, is sure to bring a smile to the face of even the most die hard of cynics.